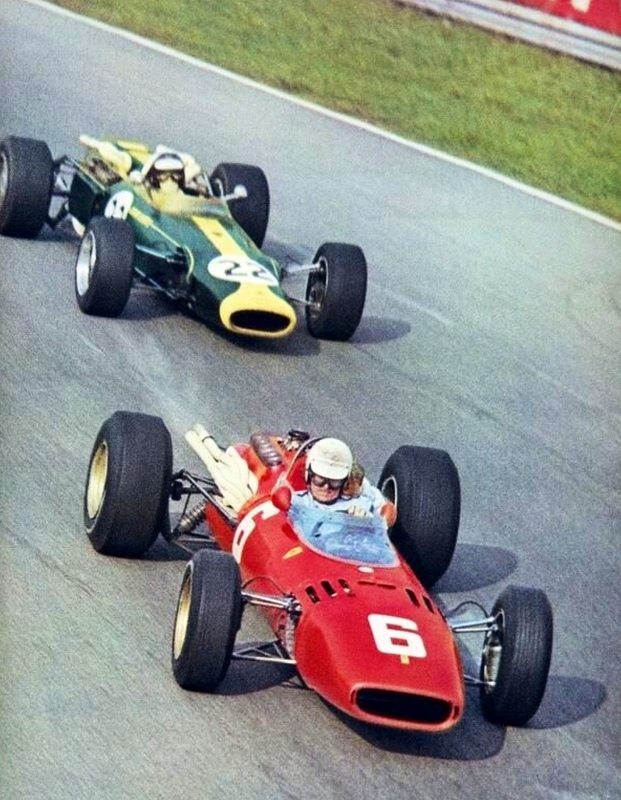 The 1966 South African Grand Prix…whilst not that year a Championship round was the first race of the new 3 litre F1 on 1 January. In December 1965 the first 3 Litre RB620 ‘E3’ was assembled and with slightly larger inlet valves, ports and throttle bodies than the ‘2.5’ produced 280bhp @ 7500rpm. After six hours testing it was rebuilt, shipped to the UK and fitted to Jacks ‘BT19’, a chassis built during 1965 for the stillborn Coventry Climax 16 cylinder engine, the rear frame modified to suit ‘RB620’. Brabham started from pole and lead until the Lucas injection metering unit drive coupling failed. He achieved fastest lap but was the only 3 litre present. During a preliminary race the car set a lap record- the race won by Stewart’s BRM. 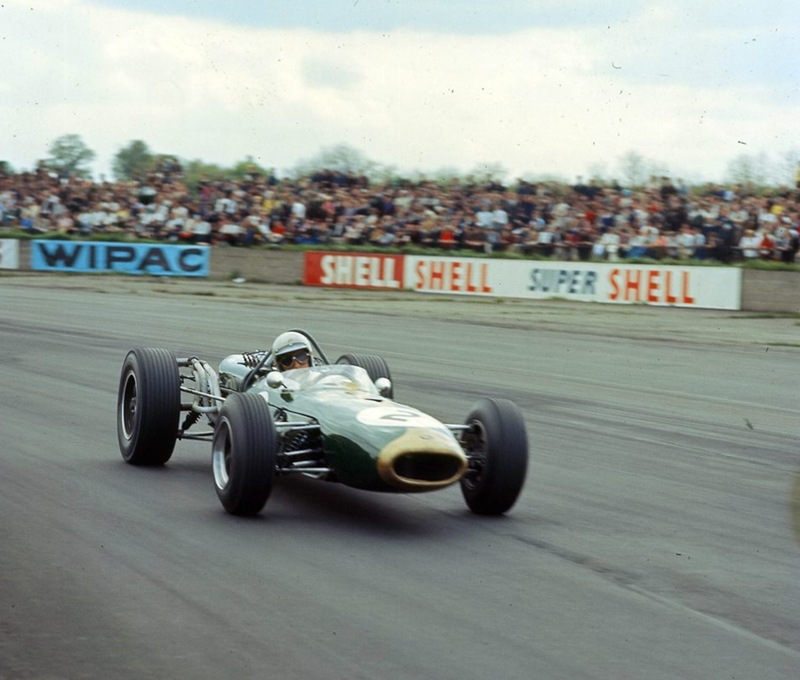 But in the main race but an oil flow relief valve failed, causing engine damage, Stewart won from Clark Lotus 39 Climax and Graham Hill in the other BRM P261. Upon dissasembly, it was found a sintered gear in the pressure pump had broken. The engine was then rebuilt for the final Tasman round at Longford Tasmania. 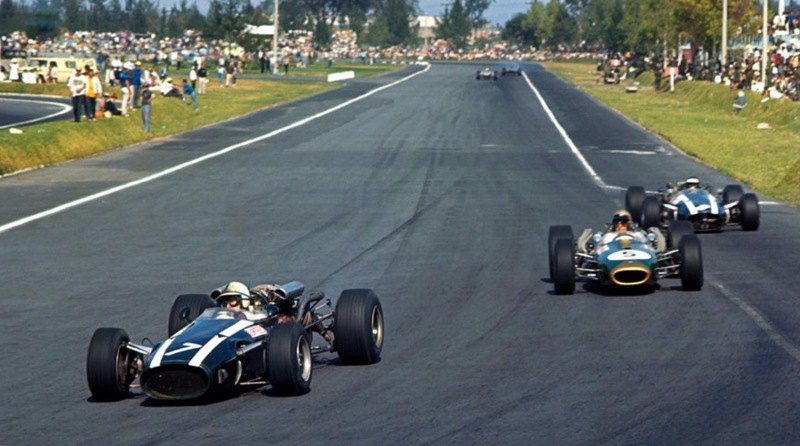 In a close race, with the engine overheating, the car ran short of fuel and was beaten by the two 2 litre BRM P261’s (bored out 1.5 litre F1 cars) of Stewart and Hill, Jackie Stewart easily winning the 1966 Tasman Championship for the Bourne team. 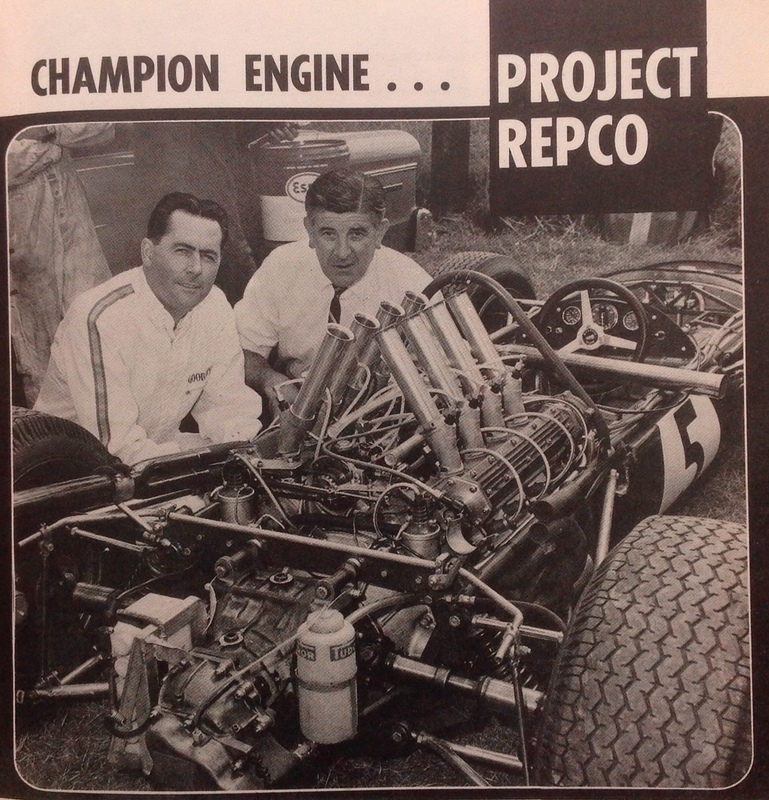 In early January 1966 the engine operation was transferred from Repco’s experimental labs in Richmond to the Maidstone address and factory covered in episode 2 where the operations were ‘productionised’ to build engines for both BRO (Brabham Racing Organisation) and customers. So far the engine had not covered itself in glory but invaluable testing was being carried out and problems solved. All teams faced the same challenge of a new formula, remember that Coventry Climax, the ‘Cosworth Engineering’ of the day were not building engines forcing the ‘English Garagistes’ as Enzo Ferrari disparagingly described the teams, to find alternatives, as Jack had done with Repco. 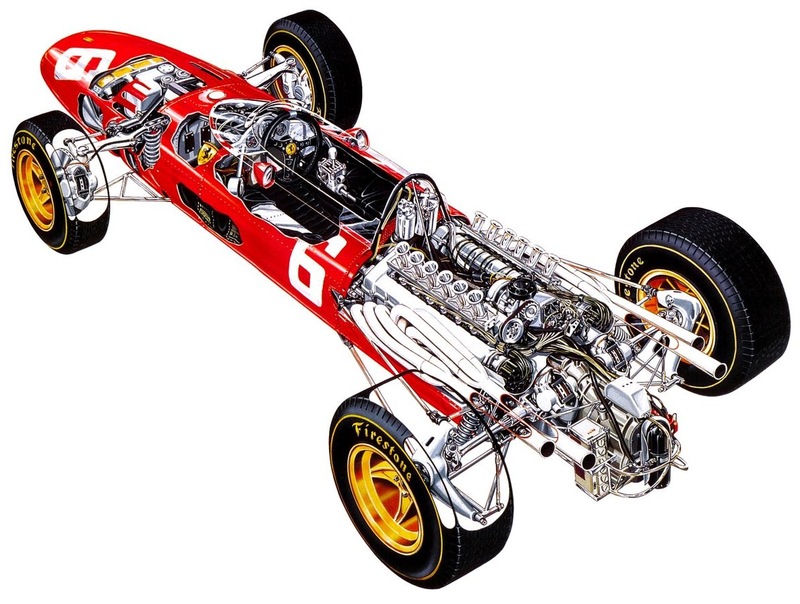 Ferrari were expected to do well, as they had done with the introduction of the 1.5 litre Formula in 1961, they had a new chassis and an engine ‘in stock’, which was essentially a 3 litre variant of their 3.3 litre P2 Sports Car engine, the ‘box derived from that car as well. The gorgeous bolide looked the goods but was heavy and not as powerful as was claimed or perhaps Repco’s horses were stallions and the Italian’s geldings! 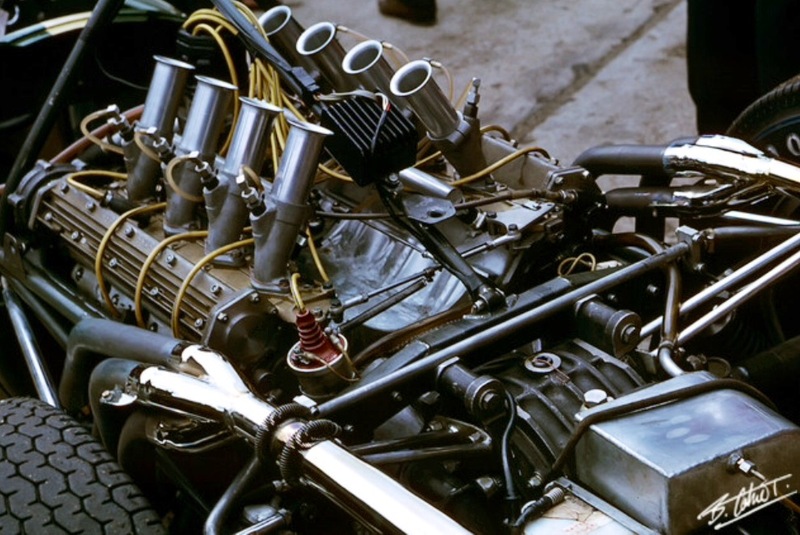 Cooper also used a V12, a 3 litre, updated variant of the 2.5 litre engine Maserati developed at the end of the 250F program in 1957 when it was tested but unraced. 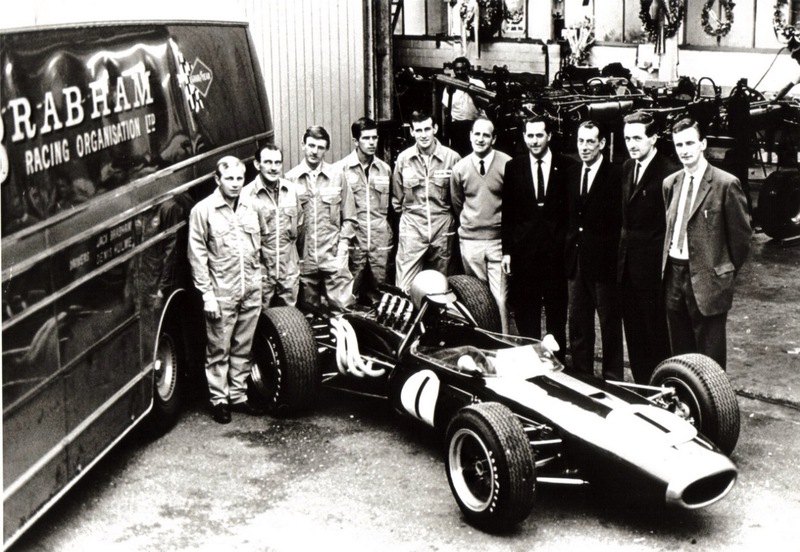 Dan Gurney had left Brabham and built a superb car designed by ex-Lotus designer Len Terry. 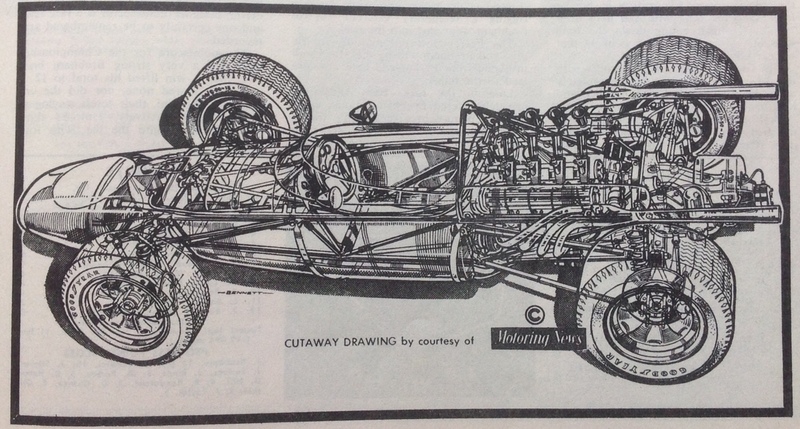 The T1G Eagle was to use Coventry Climax 2.7 litre FPF power until Dans’ own Gurney-Weslake V12 was ready. Again, the car was heavy as it was designed for both Grand Prix and Indianapolis Racing where regulation compliance added weight. Denny Hulme stepped up to fulltime F1 to support Jack in the other Brabham. 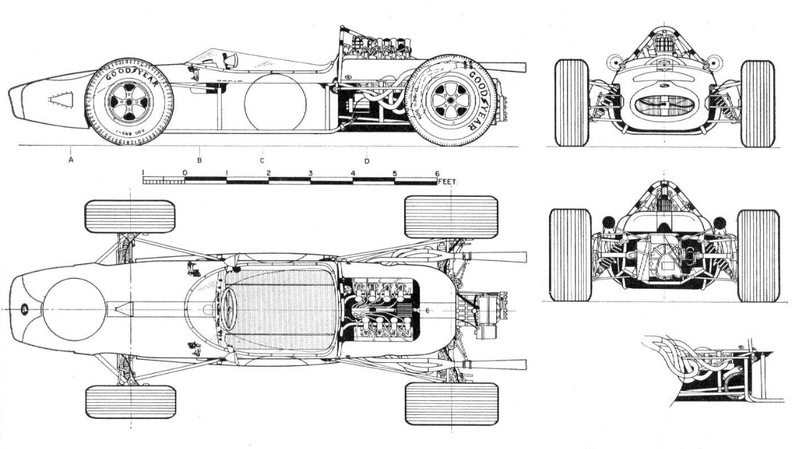 The dominant marque of the 1.5 litre formula , Lotus were caught without an engine and contracted with BRM for their complex ‘H16’ and were relying also on a 2 litre variant of the Coventry Climax FWMV 1.5 V8…simultaneously Keith Duckworth was designing and building the Ford funded Cosworth DFV, but its debut was not until the Dutch Grand Prix in 1967. BRM, having failed to learn the lessons of complexity with their supercharged V16 1.5 litre engine of the early 50’s, and then reaping the benefits of simplicity with the P25/P48/P57, designed the P83 ‘H16’, essentially two of their 1.5 litre V8’s at 180 degrees, one atop the other with the crankshafts geared together. 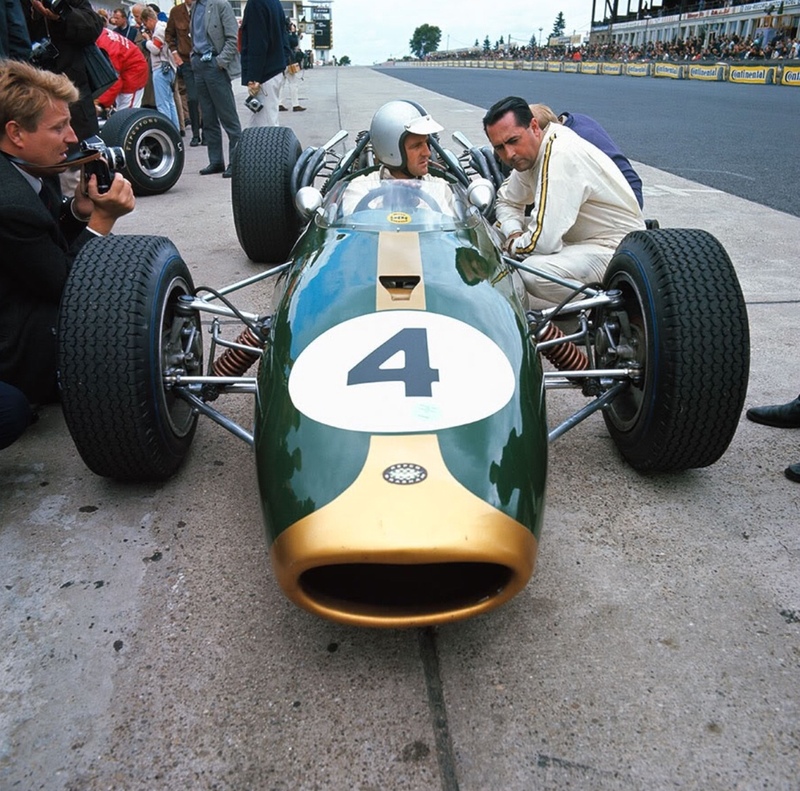 They, like Lotus were also using 2 litre variants of their very fast, compact, light and simple 1965 F1 cars, the P261 whilst developing their ‘H16′ contender. 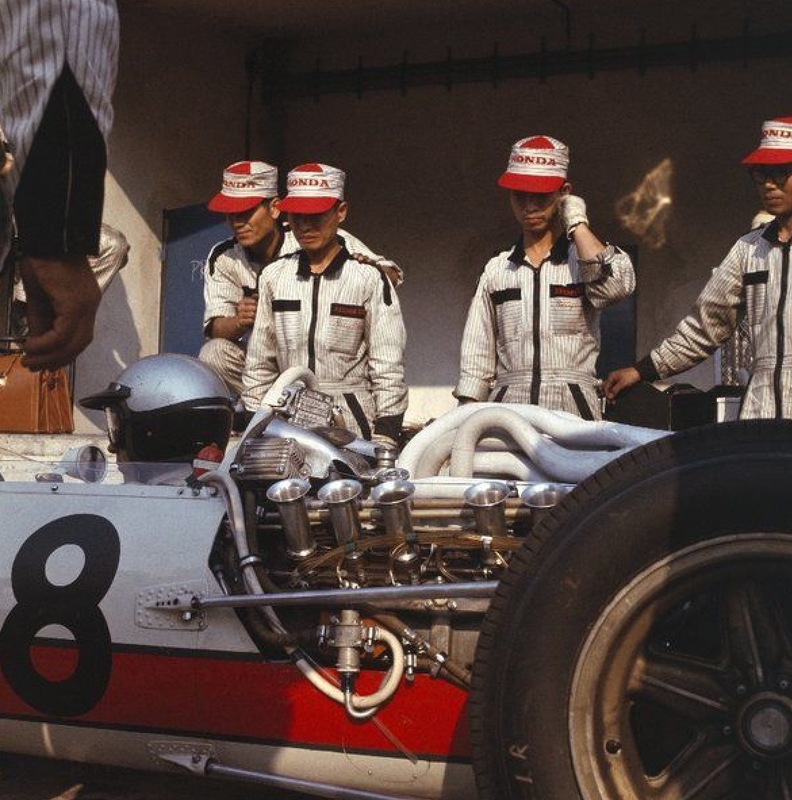 Honda won the last race of the 1.5 litre formula in Mexico 1965 and were busy on a 3 litre V12 engined car, the RA273 appeared later in the season in Richie Ginthers’ hands. Bruce Mclaren produced his first GP cars, the Mclaren M2A and M2B, technically advanced monocoque chassis of Mallite construction, a composite of balsa wood bonded between sheets of aluminium on each side. His engine solution was the Ford ‘Indy’ quad cam 4.2 litre V8, reduced to 3 litres, despite a lot of work by Traco, the engine whose dimensions were vast and heavy, developed way too little power, the engine and gearbox weighing not much less than BT19 in total…He also tried an Italian Serenissima engine without success. 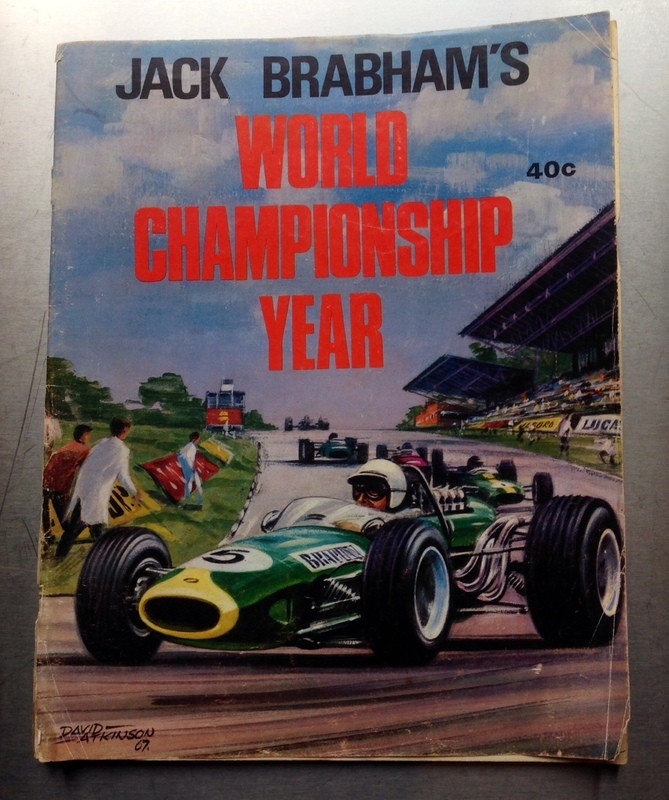 Brabham contested two further non-championship races…with the original engine in Syracuse where fuel injection problems caused a DNF and at Silverstone on May 14 where the car and engine achieved their first wins, Brabham also setting the fastest lap of the ‘International Trophy’. Clark qualified his small, light Lotus 33 on pole with John Surtees in the new Ferrari alongside. Jack was feeling unwell, and the cars were late arriving after a British seamens strike, Jack recorded a DNF, his Hewland HD 500 gearbox jammed in gear. Mike Hewland was working on a stronger gearbox for the new formula, Jack used the new ‘DG300′ transaxle for the first time at Spa. 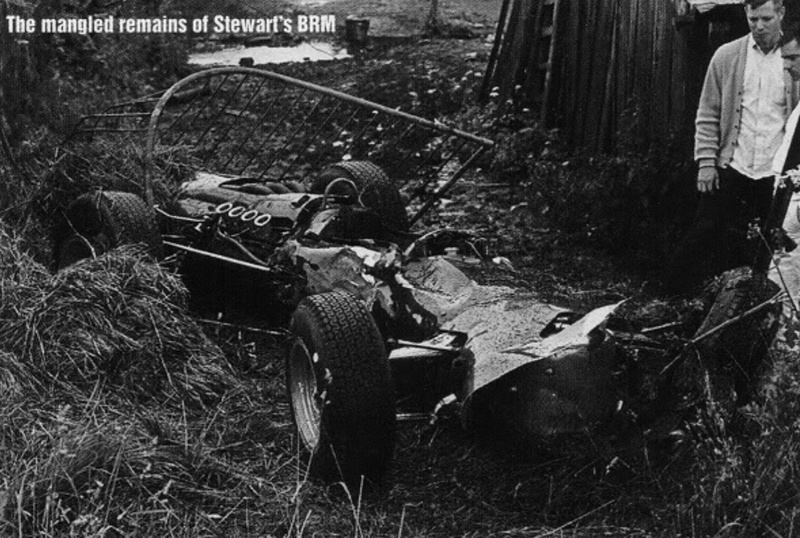 Clarks’ ‘bullet-proof’ Lotus 33 broke an upright, then Surtees’ Ferrari should have won but the ‘slippery diff’ failed leaving victory to Jackie Stewarts’ 2 litre BRM P261. 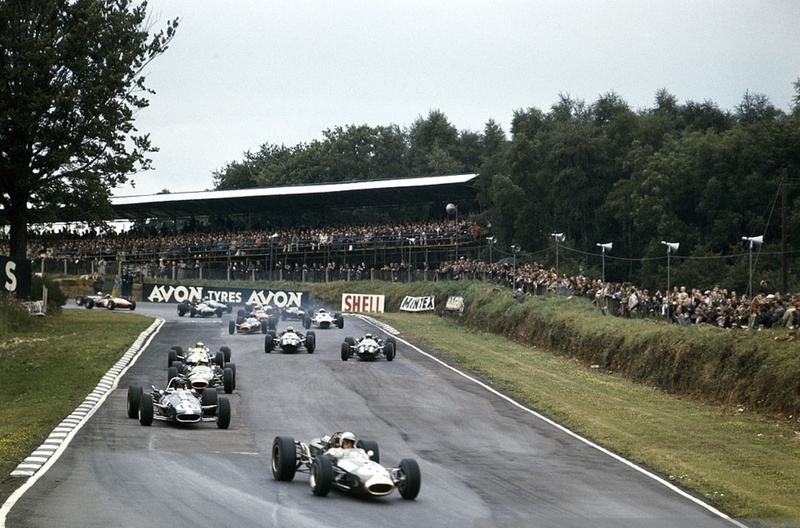 Off to Spa, and whilst Brabham was only fourth on the grid…he was quietly confident but a deluge on the first lap caused eight cars to spin, the biggest accident of Jackie Stewarts’ career causing a change in his personal attitude to driver, car and circuit safety which was to positively reverberate around the sport for a decade. 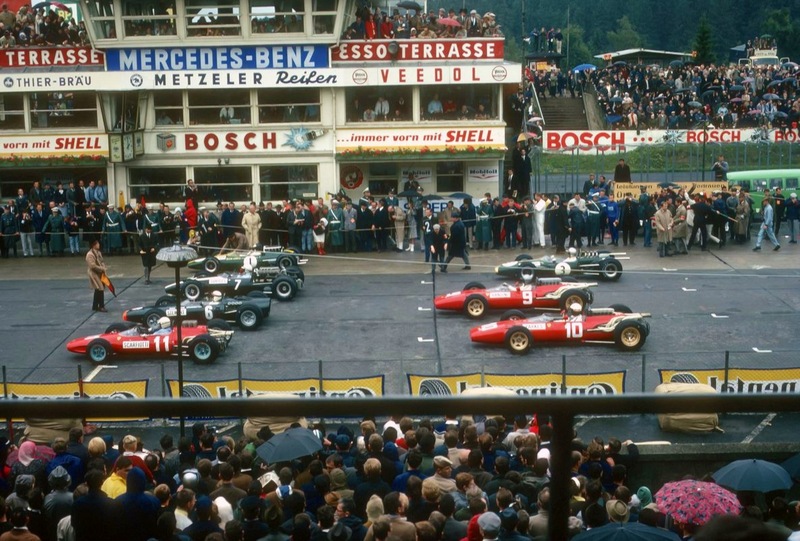 Surtees won the race from Jochen Rindt in a display of enormous bravery in a car not the calibre of the Ferrari or Brabham, Jack finished fourth behind the other Ferrari of Lorenzo Bandini. 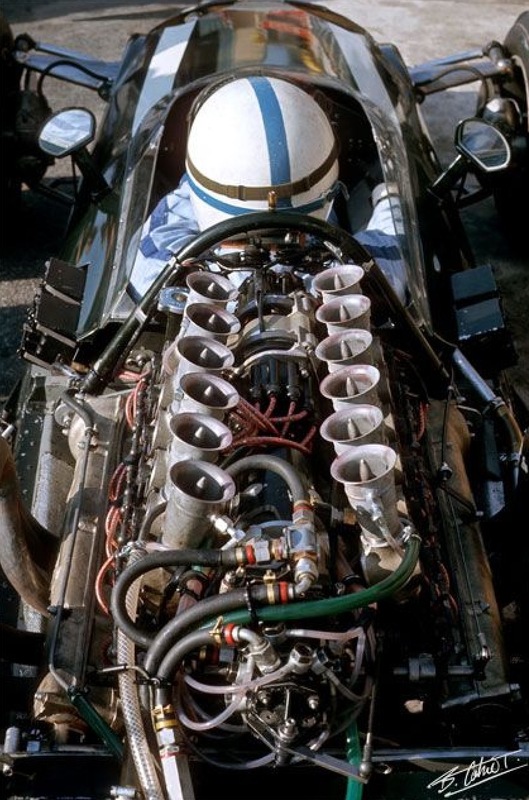 Denny Hulme still driving a Climax engined Brabham. At this stage of the season, the ‘bookies pick’, Ferrari, were looking pretty handy. Dunlops’ dominance of Grand Prix racing started with Engleberts’ final victory when Peter Collins won the British Grand Prix for Ferrari in 1958. 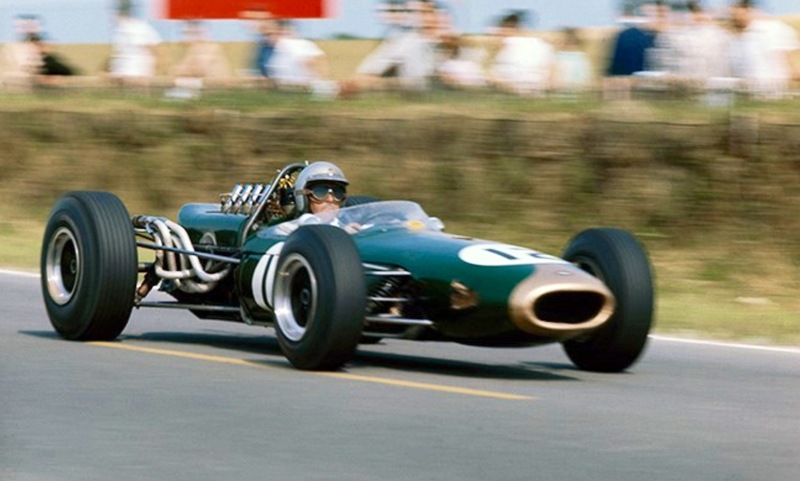 Essentially Dunlops’ racing tyres were developed for relatively heavy sports prototypes, as a consequence the light 1.5 litre cars could compete on the same set of tyres for up to four GP’s Jimmy Clark doing so in his Lotus 25 in 1963! 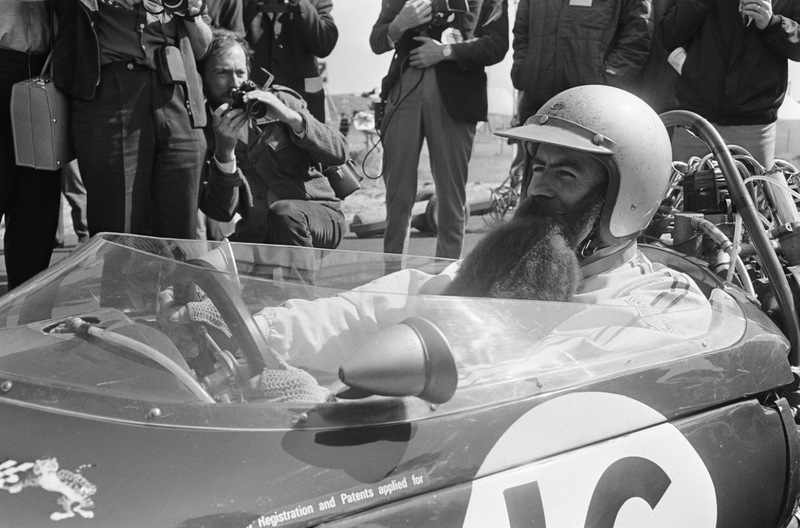 Goodyear provided tyres for Lance Reventlows’ Scarab team in 1959, returned to Indianapolis in 1963, to Europe in Frank Gardners’ Willment entered Lotus 27 F2 at Pau in 1964 and finally Grand Prix racing with Honda in 1964. 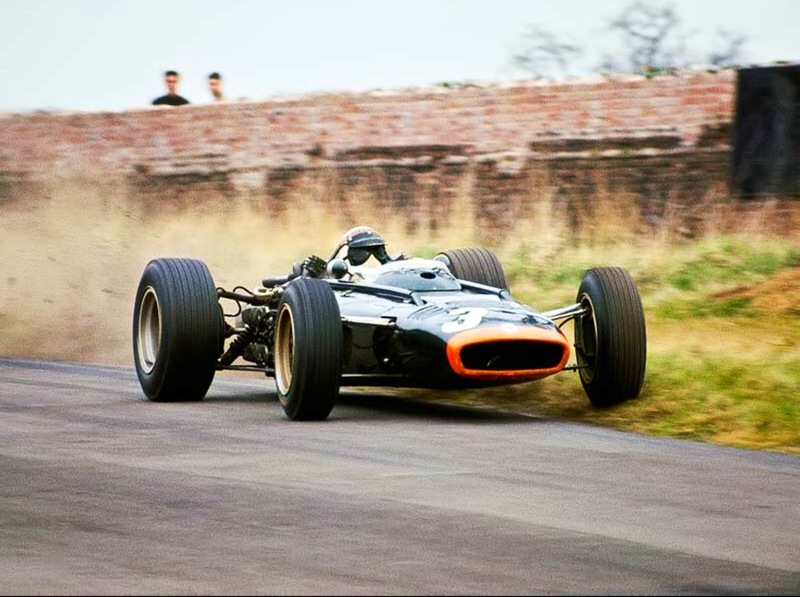 In a typically shrewd deal, Brabham signed with Goodyear in 1965, it’s first tyres for the Tasman series in 1965 were completely unsuitable but within days a new compound had been developed for Australian conditions, this was indicative of the American giants commitment to win. 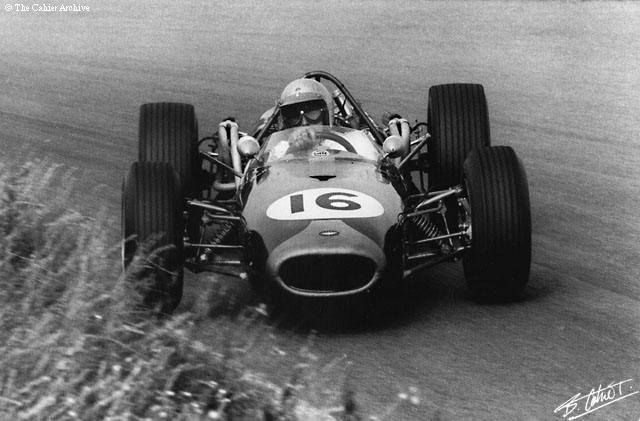 By 1966 Goodyear was ready for its attack on the world championship, we should not forget the contribution Goodyears’ tyre technology made to Brabhams’ wins in both the F1 World Championship and Brabham Honda victory in the F2 Championship that same year. Equally Goodyear acknowledged Brabhams’ supreme testing ability in developing its product which was readily sought by other competitors at a time when Dunlop and Firestone were also competing…a ‘tyre war’ unlike the one supplier nonsense which prevails in most categories these days. 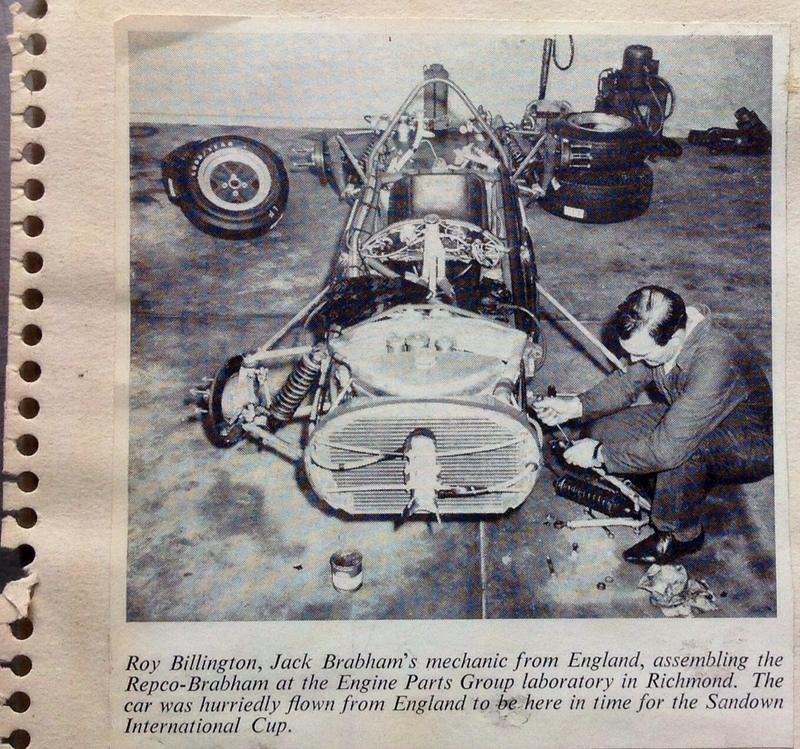 Brabham arrived with three cars- Hulmes’ Climax engined car as a spare and finally an ‘RB620’ engined car for the Kiwi. Perhaps even more critically for Brabham, John Surtees had left Ferrari in one of the ‘Palace Upheavals’ which occurred at Maranello from time to time, fundamentally around Surtees’ view on the lack of F1 emphasis, the team still very much focussed on LeMans and the World Sports Car Championship, where the marques decade long dominance was being challenged by Ford. Reims was the ultimate power circuit so it was not a surprise when four V12’s were in front of Brabham on the grid, the Surtees and Rindt Coopers and the two Ferraris. 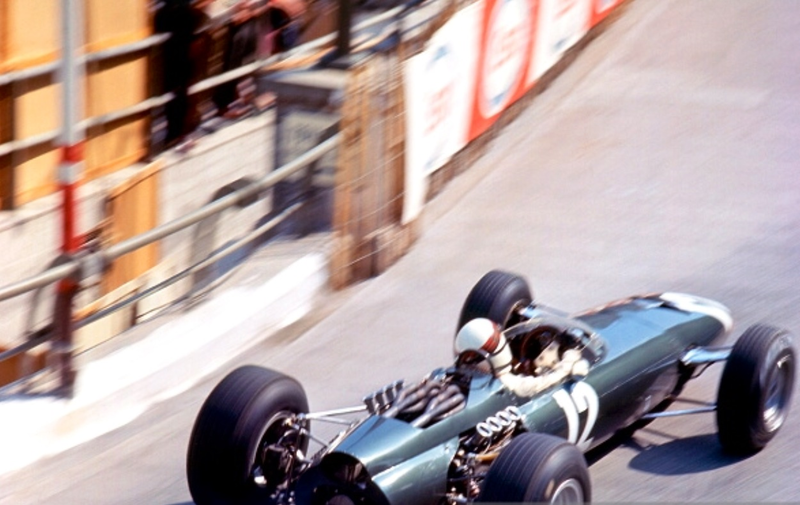 Surtees Cooper failed, and Jack hung on, but was losing ground to Bandini, until his throttle cable broke with Brabham leading and then winning the race. 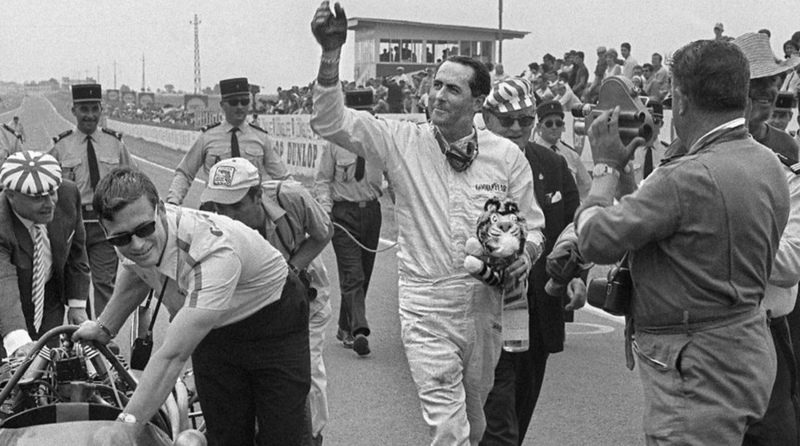 It was Jacks’ first Championship GP win since 1960, and the first win for a driver in a car of his own manufacture, a feat only, so far matched by Dan Gurney at Spa in 1967. It was, and is a stunning achievement, but there was still a championship to be won. They were victims of an industrial dispute in Italy. 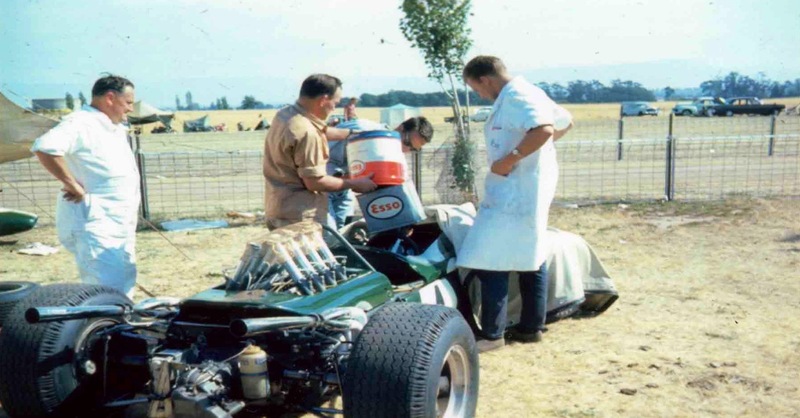 Cooper were still sorting their Maser V12, the H16 BRM’s did not race nor did the Lotus 43, designed for the BRM engine. 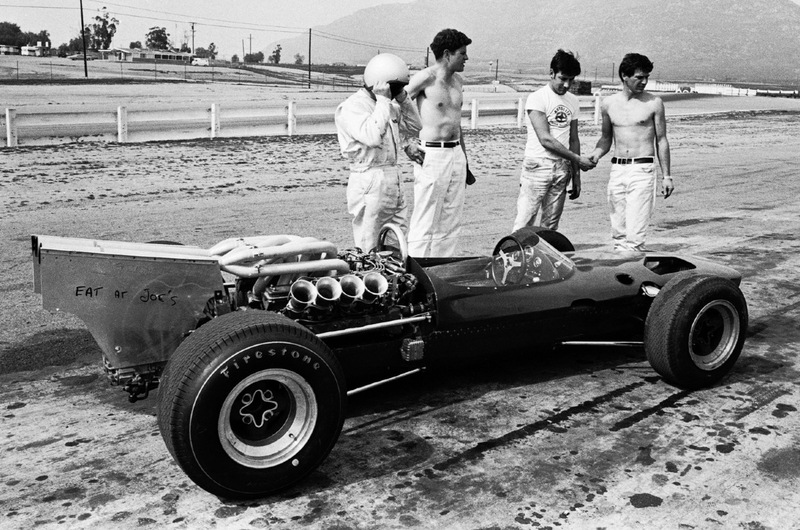 BRM and Lotus were still relying on 2 litre cars. 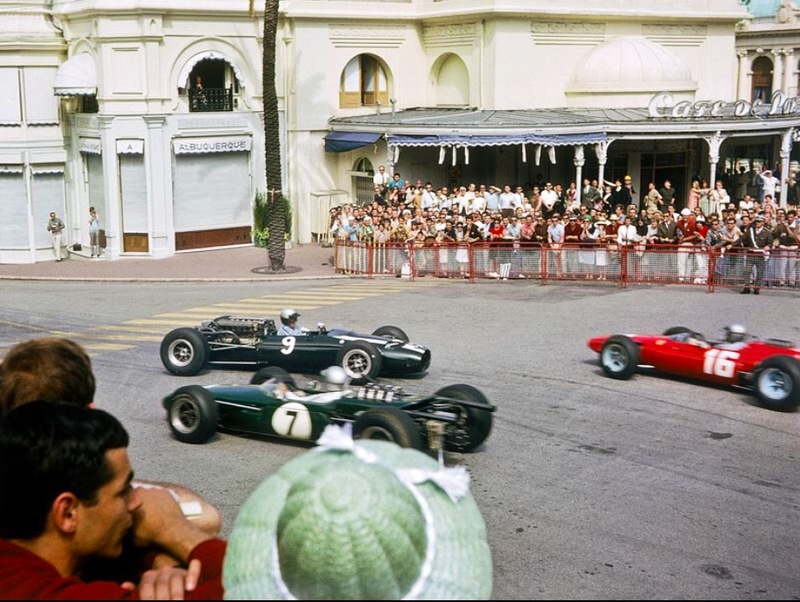 Brabham and Hulme were on pole and second on the grid, finishing in that order, a lap ahead of Hill and Clark. Brabham and Hulme again qualified one-two but Jim Clark drove a stunning race in his 2 litre Lotus leading Jack for many laps, the crafty Brabham, just turned forty playing a waiting game and picking up the win after Clarks’ Climax broke its dynamic balancer, the Scot pitting for water and still being in second place when he returned, such was his pace. Clark fell back to third, Hill finishing second, the Ferraris and Coopers off the pace. Brabham qualified poorly in fifth after setup and gearbox dramas. Clark, Surtees, Stewart and Bandini were all ahead of Jack with only Surtees, of those drivers in a 3 litre car! 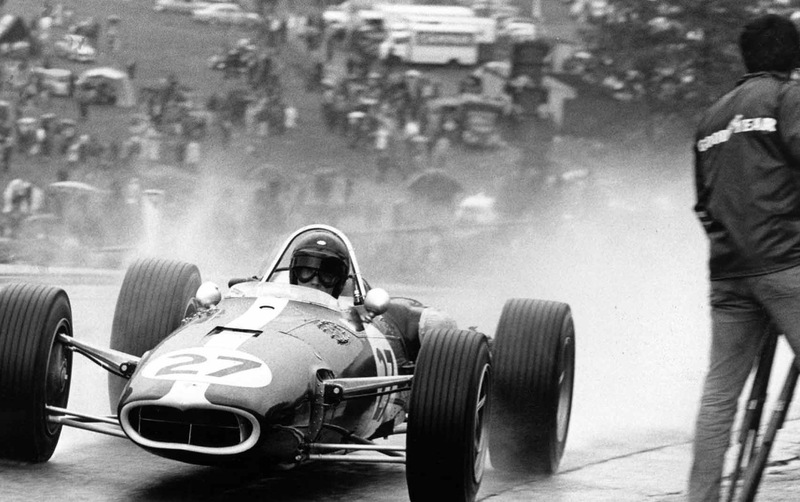 The race started in wet conditions, Jack slipped into second place after a great start by the end of lap one and past Surtees by the time the pack passed the pits, Surtees suffered clutch failure widening the gap between he and Brabham, Rindt in the other Cooper finishing third. 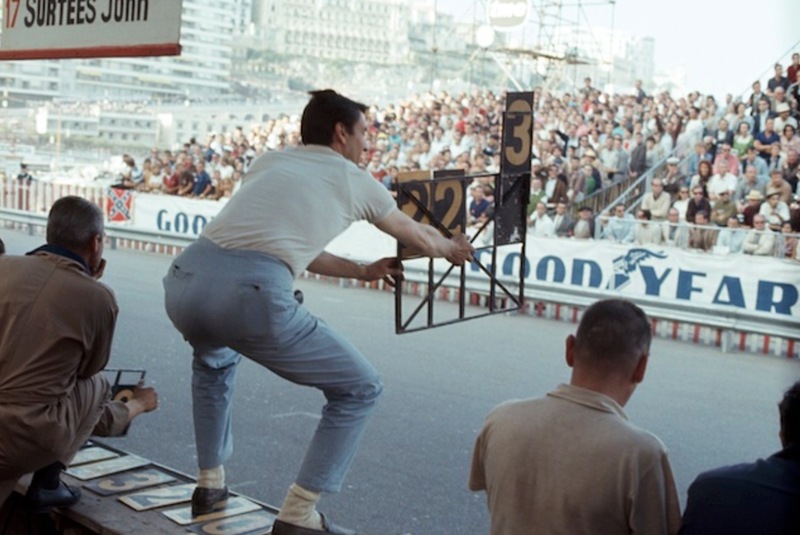 Hulme was as high as fifth but lack of ignition ended his race. 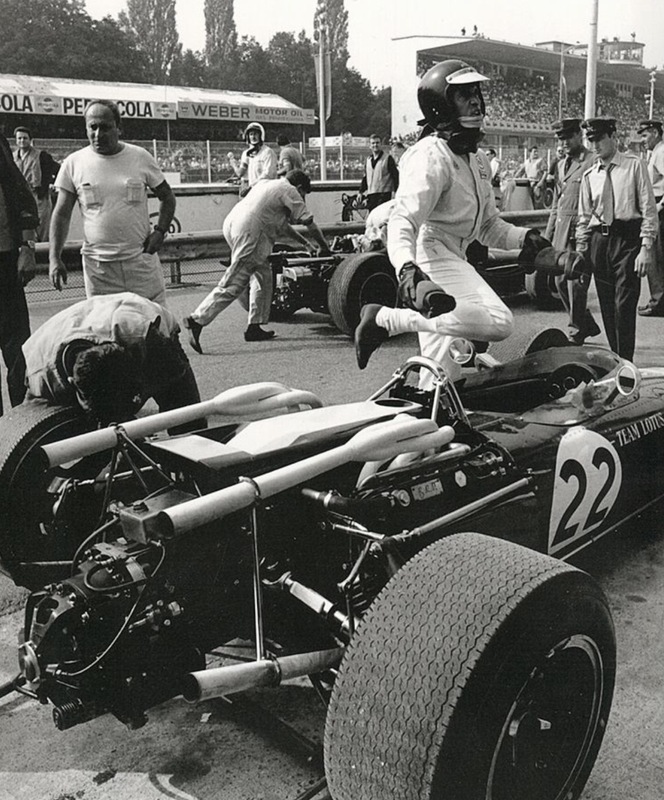 Hill and Surtees were still slim championship chances as the circus moved on to Monza. Ferrari traditionally perform well at home…and so it was, Ludovico Scarfiotti winning the race on September 4. Another power circuit, Brabham was outqualifed by five ‘multis’ the V12’s, the Ferraris of Parkes (pole) Scarfiotti and Bandini, the Cooper of Surtees and the H16 Lotus 43 BRM of Clark in third. 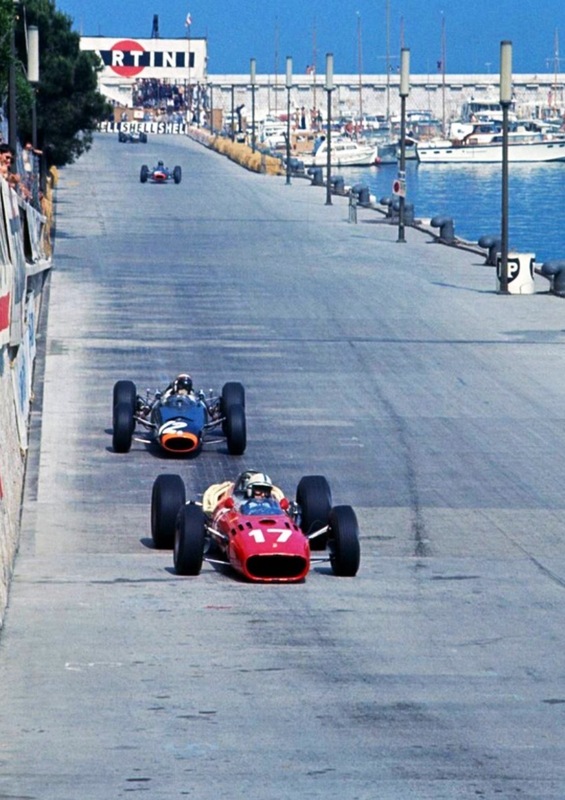 The Ferraris lead from the start from Surtees, but Brabham sensing a slow pace took the lead only losing it when an inspection plate loosened at the front of the engine, burning oil, the lubricant not allowed to be topped up under FIA rules. Hulme moved into second as Jack retired. The lead changed many times but Surtees retirement handed the titles to Brabham, Scarfiotti winning the race from Parkes and Hulme. The cars were scrutineered and weighed at Monza. The weights of the cars was published by ‘Road and Track’ magazine. 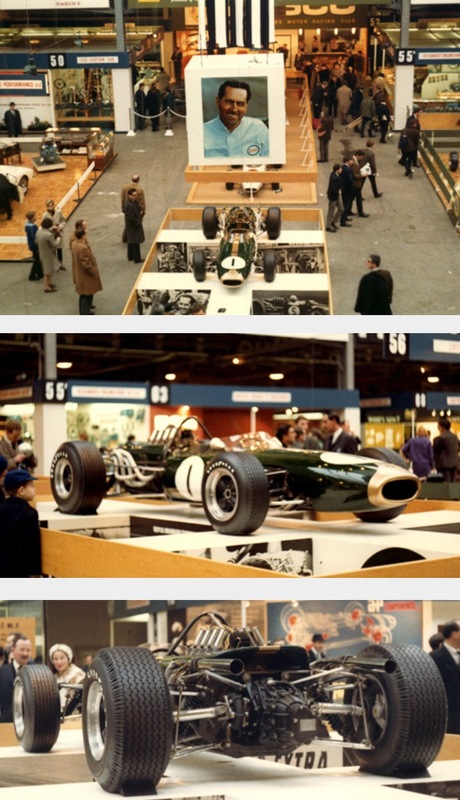 BT19 was ‘Twiggy’ at 1219Lb, the Cooper T81 1353Lb, BRM 1529Lb, similarly powered Lotus 43 1540Lb and Honda RA273 1635Lb. Lets say the Repcos’ horses were real at 310bhp, Ferrari and Cooper (Maserati) optimistic at 360 and BRM and Honda 400’ish also a tad optimistic…as to power to weight you do the calculations! 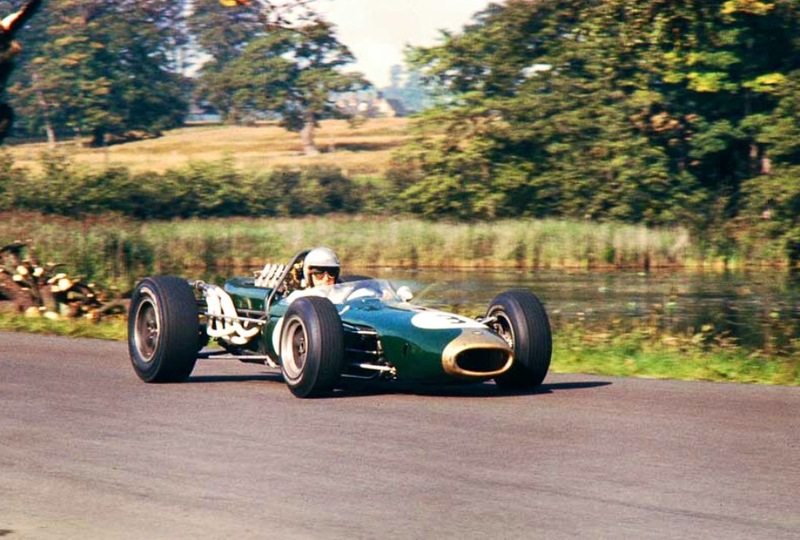 Jim Clarks’ Lotus 43 BRM achieved the ‘H16’s only victory at Watkins Glen…the Scot using BRM’s spare engine after his own ‘popped’ at the end of US Grand Prix practice. Jack’s engine broke a cam follower in the race, Denny also retiring with low oil pressure. The race won by John Surtees from pole, in a year when he had been very competitive, and perhaps unlucky. Having said that, had he stayed at Ferrari perhaps he would have won the title, the Ferrari competitive in the right hands. Brabham was fourth on the grid, best of the non-V12’s with Richie Ginther again practicing well in the new, big, incredibly heavy V12 Honda RA273. Surtees’ development skills would be applied to this car in 1967. 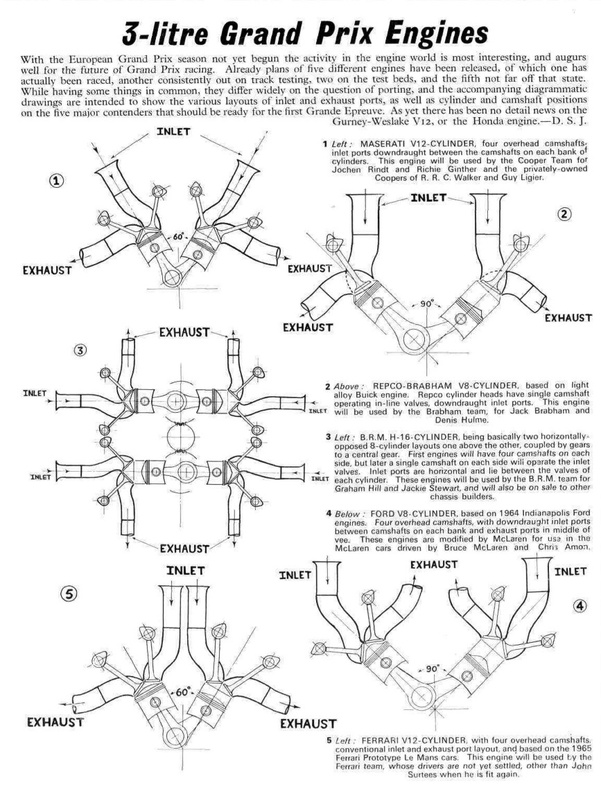 Malcolm Prestons’ book ‘Maybach to Holden’ records that 3 litre engines ‘E5, E6, E7 and E8’…were used by BRO in 1966, in addition to E3, all having at least one replacement block. Some engines were returned to Melbourne for re-building and at least three were sold in cars by Brabham to South Africa and Switzerland, whether Repco actually consented to the sale of these engines, ‘on loan’ to BRO is a moot point!, but parts sales were certainly generated as a consequence. Detail development of the ‘RB620’ during the season resulted in the engines producing 310 bhp @ 7500rpm with loads of torque and over 260bhp from 6000-8000rpm. 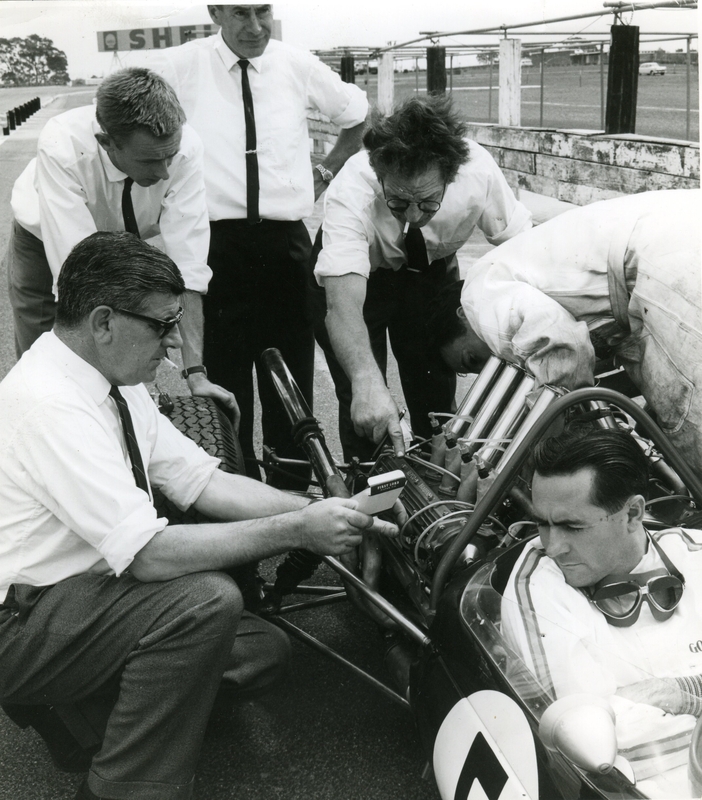 The Tasman ‘620’ 2.5 litre engine was not made available to Australasian customers in 1966, they were in 1967, a Repco prepared Coventry Climax FPF won the ‘Gold Star’, the Australian Drivers Championship in 1966, Spencer Martin winning the title in Bob Janes’ Brabham BT11A. 4.4 litre ‘RB620′ engines were built for Sports Cars, notably Bob Janes’ Elfin 400, we will cover those in a separate chapter. 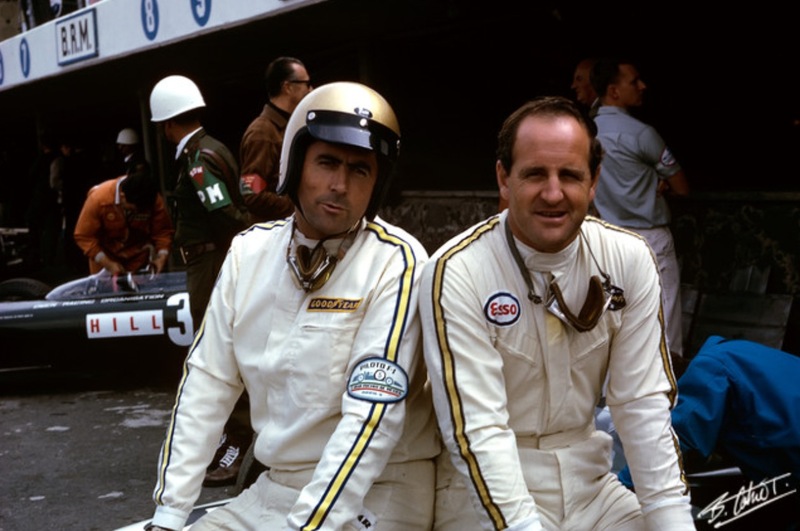 Jack Brabham and Denny Hulme, 1st and 4th in the World Drivers Championship 1966. Mexican GP 1966, lovely Bernard Cahier portrait of 2 good friends. Graham Hills’ BRM P83 ‘H16’ at rear.